As members receive this year’s volume of The Rhododendron no doubt many will be apprehensive that another dry summer season, following a period of intense discussion of widespread water shortages which in some parts culminated in another round of tightening of garden watering restrictions, will mean increased difficulties in caring for rhododendrons and other plants with similar watering needs. Most of us will already have done quite a lot already, over the past few years, to adjust our gardening practices to the demands of less favourable climatic conditions than we tended to enjoy in the past, and in particular to use water more economically. But it seems the outlook demands that we regard this as a continuing task. Unlike those less committed to a special area of interest in ornamental horticulture, most of us won’t give serious thought to “throwing in the towel” – even if at times we may feel it wise to constrain our gardening ambitions a little. At our place, the need to be better prepared for summer has meant that we’re even busier in the garden in spring - but it’s still important to find time to enjoy the best this season brings - including old favourites blooming and the fun of newer acquisitions and plantings performing. 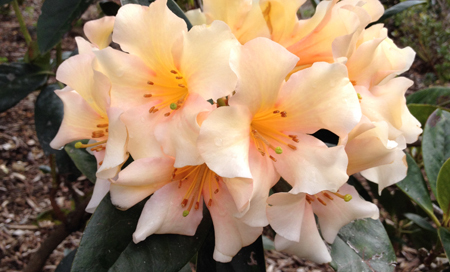 Hopefully for you a read through The Rhododendron is an enjoyable part of the season as well - something that can be done between or after more energetic gardening activities. On your behalf I thank all our contributors for 2006. Courtesy of them, we have a good variety of articles, which we trust will hold plenty of interest for all our readers.